Rooty is a medium rose gray herdsire with excellent coverage. He has produced great quality alpacas over the years. He is very straight and square and passes on a very typey head to his progeny, along with his density and crimp. He was injured a few years ago, so breedings are limited. Buy this girl with a 1/2 price breeding to any of our owned/cowned herdsires and Mataoka is sure to produce quality. This large-boned, beautiful, brown girl has produced 4 female crias and 2 males. Her first cria is true black (Harmony Grove's Nova- now owned by Bellasera Alpacas and Reserve Color Champ at 2004 Virginia Classic). Her second cria, Harmony Grove's Electra is a tuxedo rose gray (2nd Place NAAS 2005, 1st MAPACA 2005, 1st and Reserve Coastal Classic 2005). Both girls are out of The Rootbeer Float, a rose gray herdsire. 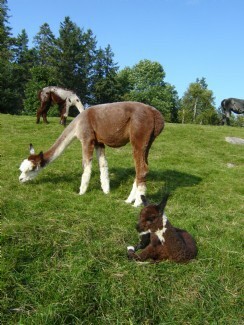 Her third cria is a beautiful dark brown female, Celeano out of Segundo. Celeano placed second at the 2007 MAPACA Jubillee. Matoaka's latest cria, Calisto is beautiful female out of Lightfoot's Sprite. Come see this girl for yourself. Matoaka has an amazingly dense, crimpy, and consistent fleece. Matoaka has a beautifully square, correct body structure. She births easily and unassisted, providing ample milk for her crias. Put this tried and true Reserve Champion girl into your breeding program today at a truly great price! This rose gray girl has it all. She has produced a rose gray and a dark brown when bred to black. Electra's coloring is a true rose gray. At the Coastal Classic, she took a first and Reserve under Kristen Berman, who said she had the finest fleece in the class. At Mapaca she took a first place. When shown at the North American, Jude Anderson placed her 2nd, but said that hers was the finest fleece in the class. She has excellent, consistent crimp and coverage. Her fleece exhibits some bundling structure. She is as easy to handle as her full sister, Harmony Grove's Nova. Electra is the 5th rose gray cria out of The Rootbeer Float, a very notable foundation rose gray herdsire. Rootbeer has consistently passed on his density, squareness, large bone, typey head, coverage, low CV, and fleece structure to his progeny. Her dam is Matoaka, our densest female, with consistent crimp. We proudly offer this beautiful offspring of The Rootbeer Float. In her background are such noteable bloodlines as Senator Taft, Ghengis Khan, Spring Snow, and Colten. First place Dark Rose Gray Full Fleece Halter Class, Mapaca 2005, Mike Safley, judging. Second place Dark Rose Gray and Dark Silver Gray Full Fleece Halter Class, North American Alpaca Show 2005. Jude Anderson, judging. First place Gray Full Fleece Yearling, Coastal Classic 2005. Kirsten Berman, jugding. Reserve Champian Gray Female, Coastal Classic 2005. Kirsten Berman, jugding. Second place Light Rose Gray Yearling Female, Empire Extravaganza 2005. Dr.Hulio Sumar, judging. 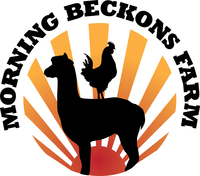 Morning Beckons Farm offers financing and payment options that make owning and breeding alpacas affordable to everyone. Ask us for details.